Scott focuses his practice on commercial transactions of all types, specializing in commercial real estate transactions; the formation and utilization of Delaware limited liability companies, partnerships, and corporations; and the rendering of legal opinions with respect to such transactions. Scott has represented major corporations, regional developers, lending institutions, and investment funds in connection with commercial real estate finance transactions, tax credit finance transactions, and other cross-border and domestic commercial transactions, with expertise in commercial leasing, entity formation and advice, secured transactions under Articles 8 and 9 of the Uniform Commercial Code, and rendering of Delaware legal opinions. He has provided commercial real estate transactional advice and land use/development advice to a wide variety of regional clients on projects in Delaware, Pennsylvania, and New Jersey, including the development and financing of the first “smart code”-based mixed-use community in New Castle County; the acquisition of major office parks in New Castle County; the negotiation of commercial leases with national retailers in New Castle County and Chester County, Pennsylvania; the acquisition by a premier charter school of a new educational campus in Northern New Castle County. He has also represented a diverse array of clients in international and domestic commercial transactions of all sizes, including lending institutions Crèdit Agricole, Barclays, JPMorgan Chase, The Royal Bank of Scotland Group and Bank of America; private equity funds The Blackstone Group and Apollo Management; real estate investment companies Simon Property Group, Kimco Realty Corporation and Developers Diversified Realty Corporation; and Fortune 500 corporations ExxonMobil and General Electric. He specializes in the provision of legal opinions in connection with commercial financing and real estate transactions; drafting and negotiation of contracts and leases; and the formation and utilization of Delaware limited liability companies, partnerships, and corporations. 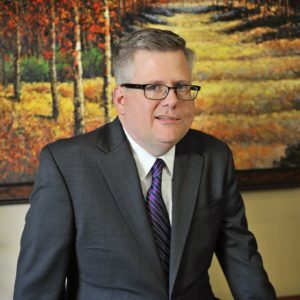 He is the author or co-author of numerous articles on Delaware corporate, alternative entity, and secured transactions law, and is an active member of the ABA Section of Business Law and the Delaware State Bar Association. • University of Virginia School of Law, Law School, J.D.